Marinated and stir-fried basil garlic chicken, served over fresh squash and zucchini noodles, tossed in a silky, herbaceous pesto and topped with salty parmesan, crunchy pine nuts and fragrant basil. 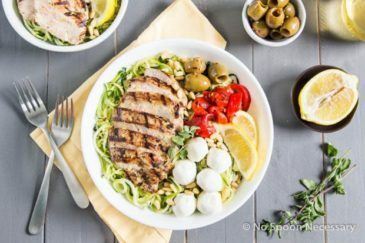 This Basil Garlic Chicken & Pesto Zucchini Noodles dish is delicious and can be prepped, ready and on the table in less than 30 minutes! This post was originally published in September 2016. 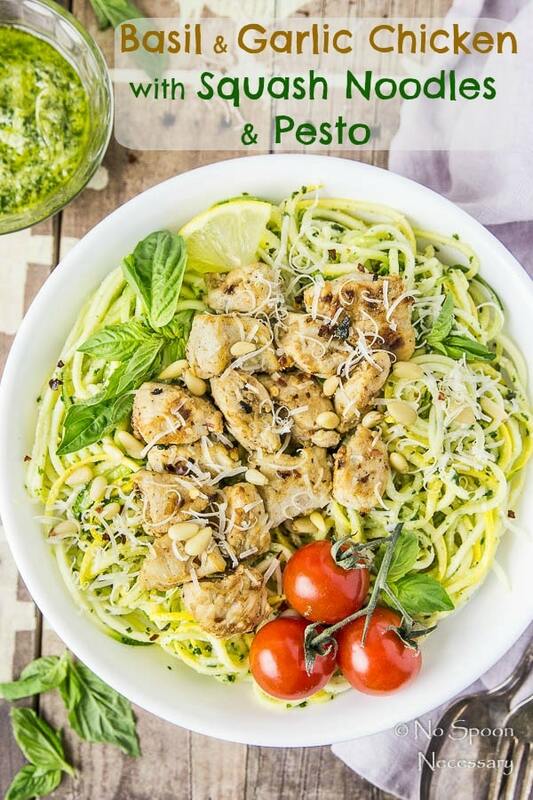 I took new photos, tweaked the recipe slightly and updated the post below to include more information about this Basil Garlic Chicken & Pesto Zucchini Noodles recipe. Plus, I added a recipe video to show you how easy this meal is to make! Hiiii friends! How was your Labor Day weekend? I hope you made the most out of your last unofficial weekend of summer! Our weekend was fine and dandy… we grilled all the things humanly possible while we sipped on summer-y libations. Basically, we basked in ALL the glory of summer. So, I have a small confession. I had something entirely different planned to post today. I’m talking, I had the ENTIRE thing written out and raring to go. And then life happened. Ummm don’t you just HATE that?! Can’t life learn stay in its own lane already? Seriously, life, you are super inconvenient at times. Anyways, things came up and I needed to postpone that post. So here I am, at the 11th hour writing a NEW post. All because I love you guys and I promised you a post today. And by golly, a new post you are GOING to get! I AM a woman of my word. But, since I’m writing this on Labor Day, so you guys can read it today (Tuesday), I am going to keep things VERY short. I’m starting to get twitchy from my desperation to be outside, frolicking in the sun. You feel me. Alright, alright, alright. (<- Said exactly like Matthew McConaughey of course). Let’s DO this. Seriously, I heart those words SO much they give me uncontrollable jazz hands.  Don’t judge. 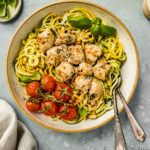 Garlicky, basil-y, tender, bite sized pieces of chicken and twirl-tastic, fresh, slightly crisp squash and zucchini noodles tossed in a silky, luscious, herbaceous pesto. Topped with plump, juicy, vine-ripe tomatoes, salty parmesan, crunchy pine nuts, spicy crushed red peppers and fragrant basil leaves. ALL the late summer yum in ONE bowl. 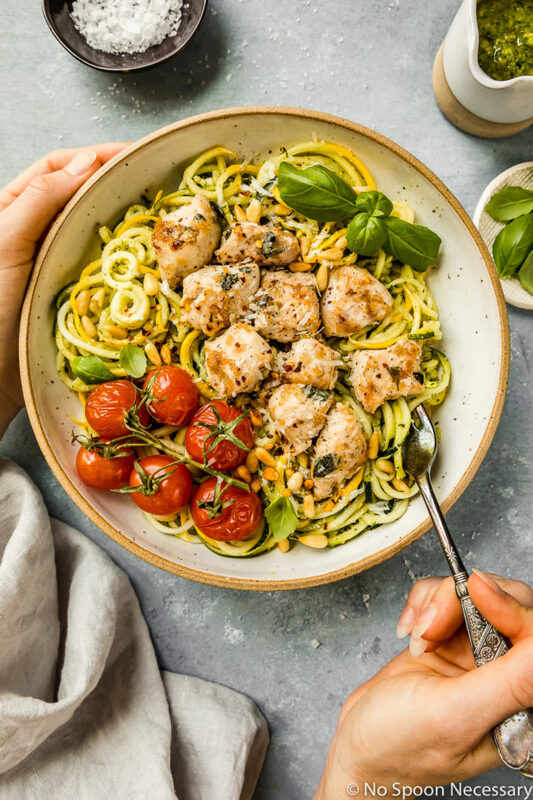 This Basil Garlic Chicken & Pesto Zucchini Noodles dish is fresh, light and healthy, yet fabulously flavorful and seriously satisfying. AND it can be prepped, cooked and on the table in less than 30 minutes. 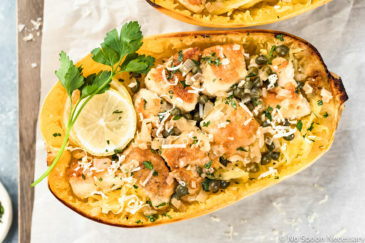 Cooking zucchini noodles for this Basil Garlic Chicken is completely optional! Once you toss the zucchini noodles with the pesto, the basil pesto sauce softens the zucchini noodles significantly and gives them a “cooked” taste. That said, you can cook the zucchini noodles if desired! While boiling and roasting zucchini noodles are two methods of cooking zucchini noodles, they aren’t my preferred method for this recipe. Sautéing zucchini noodles is by far my favorite way to cook them. It’s super quick, easy and the results are delish! To sauté zucchini noodles, simply place a skillet over medium to medium-high heat and add the zucchini noodles. Drizzle them with a bit of oil and sauté for 3-4 minutes, tossing frequently. You want to make sure you do not overcook the zucchini noodles – they should still have some crunch! How to prevent zucchini noodles from being watery? Unfortunately zucchinis are made up of more than 95% water, so zucchini noodles will never taste exactly like a real noodle, and they will have some moisture no matter what. 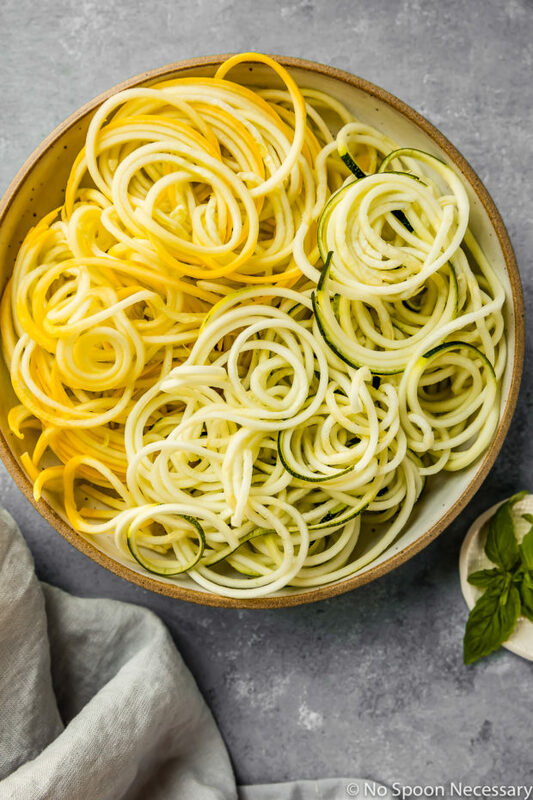 However, there are a few steps and best practices to ensure your zucchini noodles are as waterless and limp-less as possible. Never peel the zucchini prior to spiralizing! The zucchini skin prevents moisture from seeping out of the zucchini and helps the noodles keep their shape. Never add salt to your zucchini noodles prior to cooking or during cooking! Salt draws moisture out of the zucchini, so only add salt to the zucchini noodles right before eating. Do not overcook the zucchini noodles! You only want to cook your zucchini noodles for a couple minutes and they should still have crunch! Over-cooking the zucchini noodles also causes moisture to seep out of the zucchini and become mushy. Make sure you are using a firm, ripe zucchini prior to spiralizing! An overripe zucchini is guaranteed to become mushy and lifeless. How to keep pesto green? To keep your pesto a bright green color, you need to blanch the basil prior to making the pesto. While blanching the basil is completely optional, if I am planning on keeping the pesto in the refrigerator for a few days prior to using, I always take the time to blanch the basil first. There is nothing less appealing than brownish-green colored pesto. Blanching basil is very quick and easy to do! Simply place the basil leaves in gently boiling water for 5-10 seconds. Then, use a slotted spoon to remove the basil leaves and transfer them directly to a bowl of ice water to stop the cooking process. After a couple minutes, drain the leaves in a colander and transfer them to a paper towel to dry completely before proceeding to make the pesto. When does pesto expire? When is pesto bad? Homemade pesto can be stored, covered in the refrigerator, for 5-7 days. Or, pesto can be kept, frozen in a freezer-friendly, zip-closure bag for 3 months. If you want to make Basil Garlic Chicken & Pesto Zucchini Noodles even faster, you can absolutely use store-bought pesto. Purchased pesto should keep, stored in its air-tight container in the refrigerator, for up to 7-12 days. I cut my chicken into bite sized pieces roughly ¾ – 1’’ small. You can cut yours larger or smaller if you like, you will just need to adjust the cooking time accordingly. I marinated my chicken overnight, which is what I recommend for optimal flavor. However, if you are in a pinch, you can marinate it for less time. But, I wouldn’t recommend any less time than 3 hours. When cooking the basil garlic chicken make sure you are using a large sauté pan, or cook the chicken in batches. You do not want to overcrowd the pan. If you do, your pieces of chicken won’t get a nice golden brown color. If you want your pesto to be a bright green color, you can blanch your basil. This is step is completely optional, and I only blanch basil for my pesto if I plan on keeping it for a few days in the refrigerator. Blanching the basil will prevent the pesto for turning a muted green color if stored for a couple days. To do so, simply place the basil leaves in gently boiling water for 5-10 seconds. Use a slotted spoon to remove the basil leaves and transfer them to a bowl of ice water to stop the cooking process. Drain the leaves in a colander and then transfer them to paper towel to dry completely. You can either sauté the squash and zucchini noodles or serve them raw. Both options are included in the recipe below. The Basil Garlic Chicken & Pesto Zucchini Noodles are really delicious with fresh, burst cherry tomatoes! I’ve included instructions on how to make them in the notes section of the recipe below. 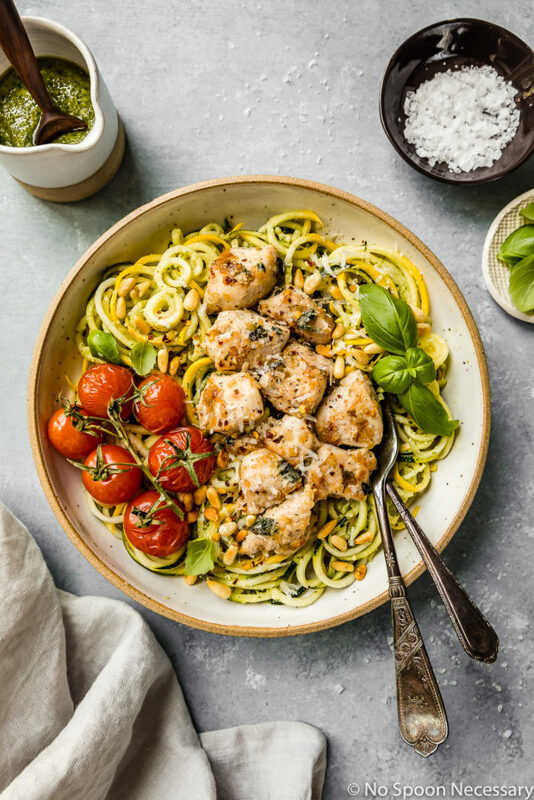 With only a couple weeks of summer remaining, and pumpkin threatening to invade your personal space, you NEED to get on this healthy, yet seriously delicious Basil Garlic Chicken & Pesto Zucchini Noodles! Don’t let summer pass you by without a proper sqoodle-y adieu! 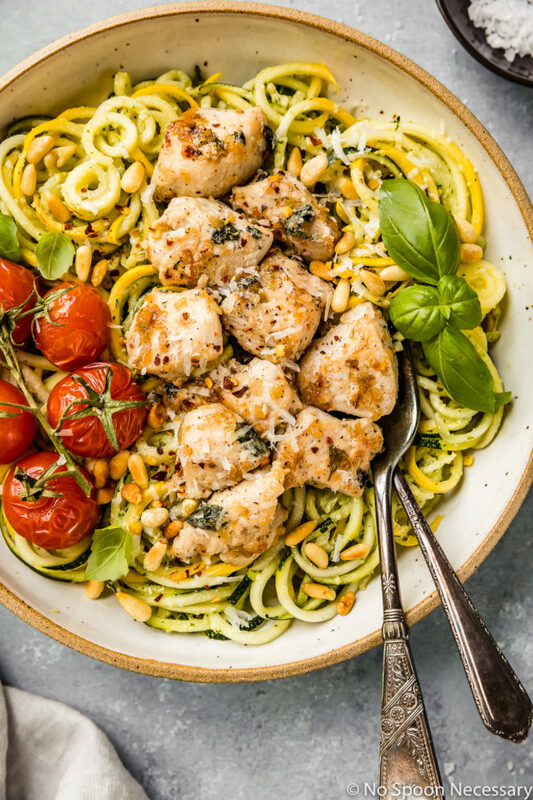 Marinated and stir-fried basil garlic chicken, served over fresh squash and zucchini noodles, tossed in a silky, herbaceous pesto and topped with plump tomatoes, salty parmesan, crunchy pine nuts and fragrant basil. 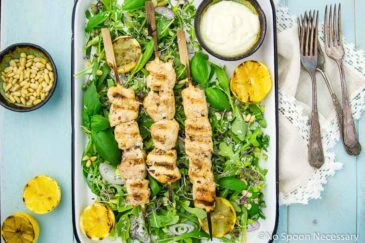 This dish is delicious and can be prepped, ready and on the table in less than 30 minutes! 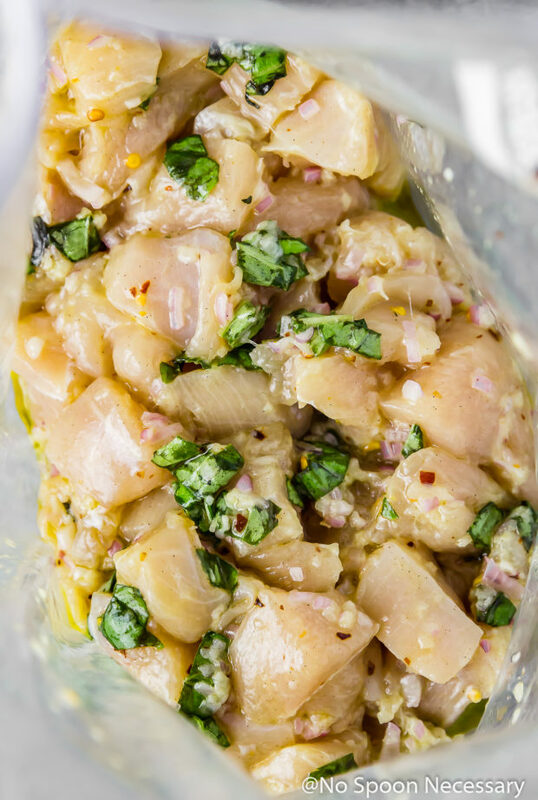 Marinate the chicken: In a small bowl whisk together 1/2 cup olive oil, vinegar, basil, 1 tablespoon shallot, 3 cloves of the minced garlic, crushed red pepper flakes, 1 1/2 teaspoons salt and 1/2 teaspoon pepper. Transfer to a large zip-closure bag and add the chicken. Toss to coat. 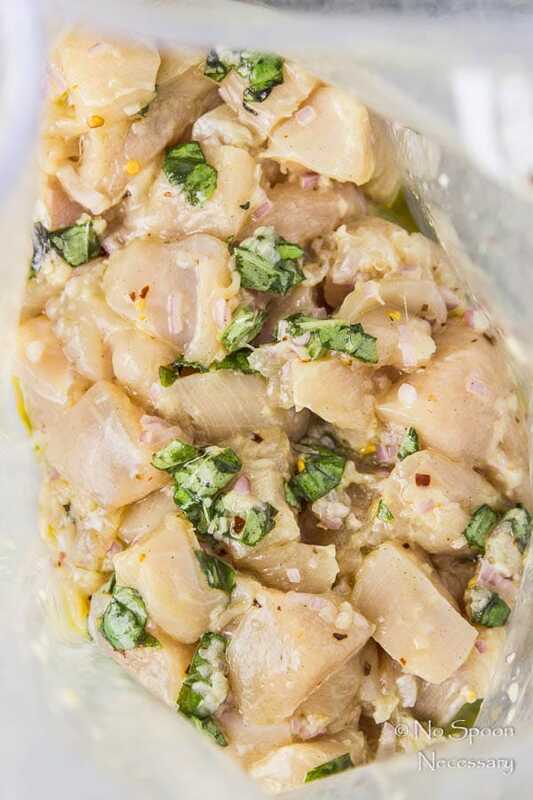 Place in the refrigerator for at least 3 hours, and up to 12 hours to marinate. 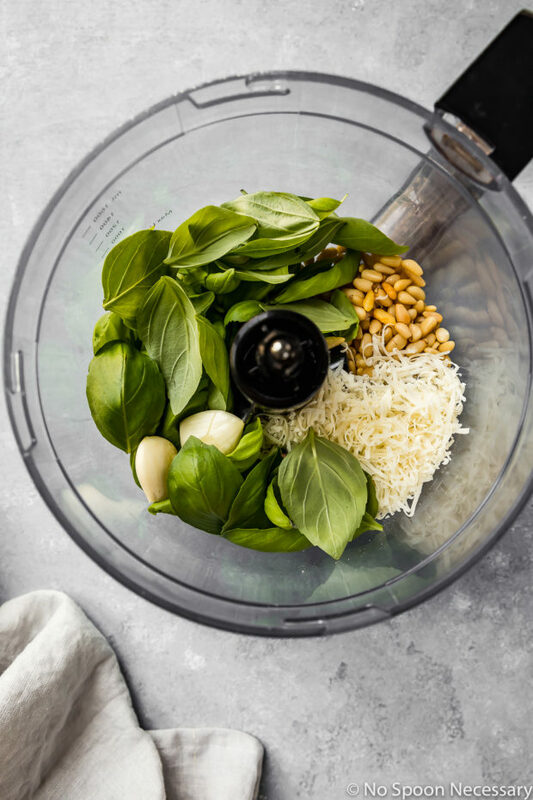 Make the pesto: In the bowl of a food processor, combine the garlic, basil, cheese, pine nuts, lemon juice, ½ teaspoon salt and ¼ teaspoon pepper. Pulse until coarsely chopped. With the processor running, slowly add in the olive oil in a steady stream. Process until smooth. Taste and adjust for seasoning with salt and pepper. Set aside. Cook chicken: In a large skillet, heat 1 tablespoon of olive oil over medium high heat. Add the remaining shallots and cook, stirring, until softened, about 2 minutes. Add remaining clove of minced garlic and stir until fragrant, about 1 minute. Remove chicken from marinade (discarding marinade) and add chicken to the skillet*. Season lightly with salt and pepper. Cook, stirring occasionally, until chicken is browned all over and cooked through, about 6 minutes total. Transfer to a clean plate and set aside. Heat zucchini noodles (OPTIONAL)*: Return skillet and reduce heat to medium. Add the zucchini noodles to skillet and drizzle lightly with olive oil. Cook, stirring, until noodles are just warmed through, about 3-4 minutes. Remove from heat and add in ¾ cup of pesto. Toss gently to combine. IF NOT HEATING NOODLES: Toss zucchini noodles with 3/4 cup of pesto to coat. Set aside. Serve: Transfer noodles to platter or bowls and top with chicken. Garnish with fresh basil, pine nuts, parmesan cheese, tomatoes and lemon wedges. Top with a dollop of pesto or serve remaining pesto on the side. Enjoy! I cut my chicken into bite sized pieces roughly ¾ - 1’’ small. You can cut yours larger or smaller if you like, you will just need to adjust the cooking time accordingly. You can either sauté the squash and zucchini noodles or serve them raw. I actually prefer them raw. Once the pesto thoroughly coats the noodles, it softens them and gives them a "cooked" taste. Just make sure you do NOT salt the zucchini noodles until ready to serve. Salt draws moisture out of the noodles and will cause them to get watery. 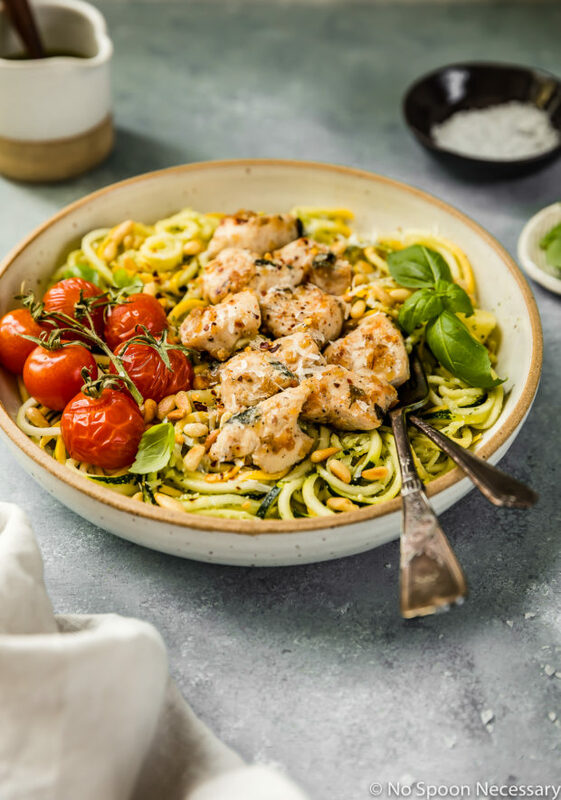 The Basil Garlic Chicken & Pesto Zucchini Noodles are really delicious with fresh, burst cherry tomatoes! Recipe as follows. Burst Cherry Tomatoes recipe - Preheat oven to 350 degrees F. Place tomatoes on a parchment paper (or non-stick foil) lined pan. Lightly drizzle tomatoes with oil and generously season with salt and pepper. Roast for 18-20 minutes or until slightly burst. Love all the tips on how to do the zucchini noodles, Cheyanne – I haven’t really experimented with them but I have lots of zucchini growing so this is super helpful! Hope it’s not too hot where you are! Love the new photos and the video Chey! This looks flavor packed and so incredibly healthy! I just grabbed some zucchini from my brother-in-law’s garden too! I know what I’ll be making! You know how I feel about pesto….and basil…and everything this dish offers! I loved it the first time I saw it, and I just might love it more, now!! DELISH! A million times yes to zoodles with pesto! How is that combo as perfect as it is? Honestly, I can take or leave zucchini on its own but add pesto to it and that’s pretty much all I want to eat ever. LOVE this recipe! This meal looks delicious!! I’ve never tried zucchini noodles but I love pesto! I love making pesto for my spaghetti meals. And your pictures are amazing. Nice recipe!